At the JY15 North American Championships, the class's top sailors take turns beating each other up on the water. For a third year, Beaufort sailor John Potter emerged as the best of the highly competitive group. 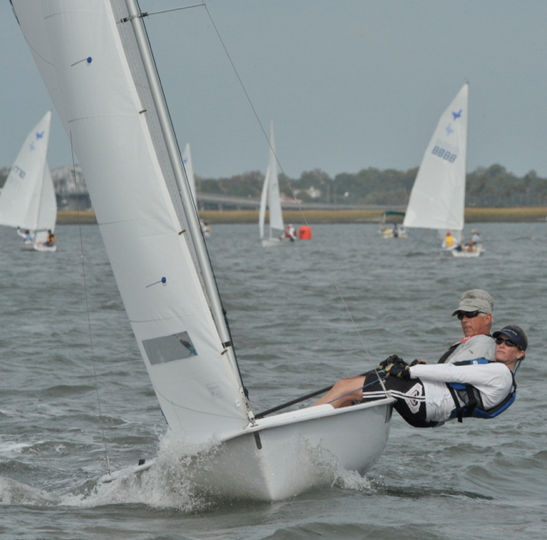 He won two of the regatta's eight races hosted by Beaufort Yacht and Sailing Club to finish with 21 points and win the event for a third time, edging New Yorker Paul-John Patin, with 25 points. Potter and his wife, Cheryl, won the final race Monday after a lack of wind postponed racing two hours. Wind picked up to an estimated 8 to 10 knots by late morning, allowing time for only one race in the Beaufort River before the noon cutoff. "The first very consistent breeze we had," John Potter said. "Today was all about a good start and boat speed, just getting out front and staying there. And we managed to do that." Potter raced with a different crew each of the three days. His youngest daughter, Emily, sailed with him Saturday. His oldest, Magan, sailed Sunday. His wife helped him clinch the title after entering the final day with a two-point advantage. "They all got a turn in the boat," Potter said. "My wife is my lucky charm. ... She's never lost in this boat. It was good to have her out there today." In his 11 years racing the regatta, Potter has finished second five times. He said competitors return for the next year's races having perfected techniques they think will give them the edge that year, and that the racing is always competitive. Before Monday, seven different sailors had claimed victory in the seven races. Potter became the only repeat winner. The longer the delay in the morning, the better Potter's slight advantage looked. "We were the only ones in the parking lot who were OK if we didn't sail a race today," Potter said. "Obviously, everybody else wanted at least one more, of not two." The top five finishers earned trophies. Mark and Lisa Allen, from Pontiac (Mich.) Yacht Club, won for top husband and wife team. Connecticut sailors Sam and Jim Vos won for best parent/child crew. Beaufort Yacht and Sailing Club's Elise Marshall grabbed honors as top junior. And Chris Vann, from Connecticut, took top honors in the Master division.